Pimlico, like many areas of London, was mostly farmland for centuries until the city’s expansion in the 1800s made it a desirable place to live. The district’s closeness to the Houses of Parliament led to it becoming a center of political activity beginning in the 20th Century, but it has largely remained a residential district with few major tourist attractions. However, that doesn’t mean Pimlico is lacking in interesting places to visit. We’ve outlined our top ten things to see and do, but you can let us know your own favorites in the comments. Yoga practitioners may want to stop and visit this blue plaque dedicated to Swami Vivekananda, one of the foremost promoters of the discipline and important Hindu philosopher. The plaque is erected at 63 St. George’s Drive, where he lived in 1896. While there’s no museum here, followers of his life and work will want to drop by and imagine his time in London as he was helping with a biography of his mentor, Ramakrishna. Rummage sales, as we know them in the United States, are always fun to visit and find deals on any manner of used goods. Pimlico puts one on every Sunday (except for Sundays that fall on holidays) and goes on even if it’s raining as there are indoor stalls as well. You never know what you’re going to find on a given week, so no two sales are alike. Craft beer has taken ahold of the public’s palate’s in recent years, and Cask has been the foremost purveyor of unique beers since 2009. Cask boasts ten cask ales, fifteen keg lines, and more than 300 bottle beers that are available for you to enjoy in the bar or take bottles home with you. They also offer traditional pub favorites, bar snacks, and a great selection of aged Angus burgers. Pimlico Toy Library was established under the belief that children need to play as part of their social development, and so the library offers over 1,900 toys and specialized toy librarians to help bring out your child’s potential through play. Children who visit the library can be part of play groups or play on their own and Wednesdays see the library host art days which can get pretty messy. As much as Islamic culture appears in the news, large portions of the public still know little about one of the world’s largest religions. You don’t have to be Muslim or interested in converting to visit the Victoria Islamic Cultural and Education Center, as the Center is just as interested in educating members of other religions about the rich history and traditions of Islam and promoting a sense of community amongst all faiths. 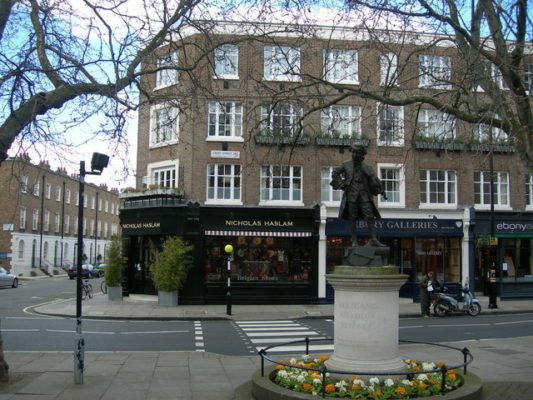 Orange Square on the far west side of Pimlico is a center of commercial activity and offers many interesting sites from the square gardens to the statue of Mozart who used to live nearby on Ebury Street. Whether you want to just relax for a bit, feed the birds, or get your bearings before setting off to another part of the district, this is a great place to start. The square also hosts a farmers’ market every Saturday from 9 am to 1 pm, offering any number of fruits, vegetables, meat, and advice for amateurs. This Pimlico charity is a great place for anyone who’s interested in learning how to sail small craft as well as powerboats, kayaks, and canoes. The base is primarily focused on providing these activities for youth but is willing to teach families, groups, and corporate teams. The Westminster Boating Base is also available for venue hire for parties, weddings, and other events, with all the proceeds going to the charity. Another spiritual center of Pimlico, St. Gabriel’s has stood on this spot since 1851 and is an excellent example of Victorian church architecture. Designed by Thomas Cundy, it’s part of the Gothic Revival style that began in the mid-18th Century. As a working church, visitors are more than welcome, but it’s best to check out the church’s schedule to make sure there’s nothing else going on, though anyone is welcome to attend services. Your gateway to Pimlico lies here at Victoria Station. The station was one of the earliest railways termini in London, serving as the depot for the London and Brighton Railway. As a terminus, it’s one of the busiest stations in London and offers opportunities to people watch, appreciate the Victorian architecture, or hop a train to nearly anywhere in Great Britain. One of the top performance venues in London’s West End, the Victoria Apollo Theater is home to everything from concerts to major musical productions. The theater originally opened as a cinema in 1930 and remained so until it was converted into a performance hall in the late-1970s. Currently, the theater is the home for the musical Wicked, so if you’re not sure whether you’re a good witch or a bad witch, you may want to see the show and figure out which is which.